The e-commerce giant, taking up around 6% of the total ad spend in the digital advertising market, is currently a minor player compared to the social media dominants Facebook and Google. Although Google and Facebook are expected to remain leaders in the US digital advertising market for the years to come, they are expected to lose a modest amount of ad revenue share through 2020. The Cowan survey, which interviewed 50 US advertising buyers, revealed that Facebook’s main social network platform is expected to lose 3 percentage points of market share by 2020. Of the 50 ad buyers, 18% said privacy concerns would lead to decreased ad spend on Facebook, more than any other platform. The concerns follow various breaches of the Facebook platform, including the Cambridge Analytica scandal and reports of audience inflation. Amazon's digital ad business, recently renamed Amazon Advertising, is forecasted to grow in a rapid pace. More budgets of brands will increasingly be dedicated to Amazon, the survey revealed. 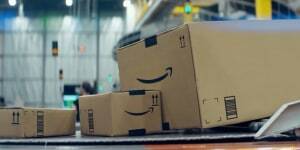 Amazon is forecasted to double its ad revenue by 2020, winning a slice of Facebook's digital ad spend, according to a study by research company Cowen.